Rihanna has revealed her favourite alcoholic beverage is a whiskey and ginger concoction. The 23-year-old pop star famously loves a good party, and often graces exclusive showbiz bashes with her presence as well as being a regular at some of the world’s most exclusive restaurants. The star has admitted one of her favourite drinks to accompany a meal is a strong whiskey-based cocktail, whereas when she goes clubbing she prefers to mix it up with exotic brews. The gorgeous singer is an accomplished dancer, and enjoys having the opportunity to strut her stuff whenever she visits nightclubs. 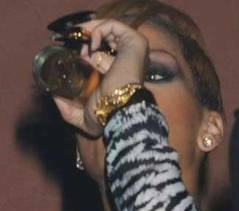 Rihanna sees nothing wrong with having the occasional drink, and has spoken in the past about the track Drink To That from her album Loud being dedicated to “all the semi-alcoholics in the world”. She thinks it’s fine for people to let their hair down at the weekend, “when you’ve got two whole days to recover”.